In news that sounds straight out of a dystopian Margaret Atwood novel, surgeons managed to keep a genetically modified pig heart alive inside a baboon for 945 days before it failed last month. “Xenotransplantation” experiments like this may one day lead to doctors raising pigs for organ transplants. The recent GM-pig-heart-in-a-baboon transplant bests the previous xenotransplantation record of 179 days, achieved at Massachusetts General Hospital. 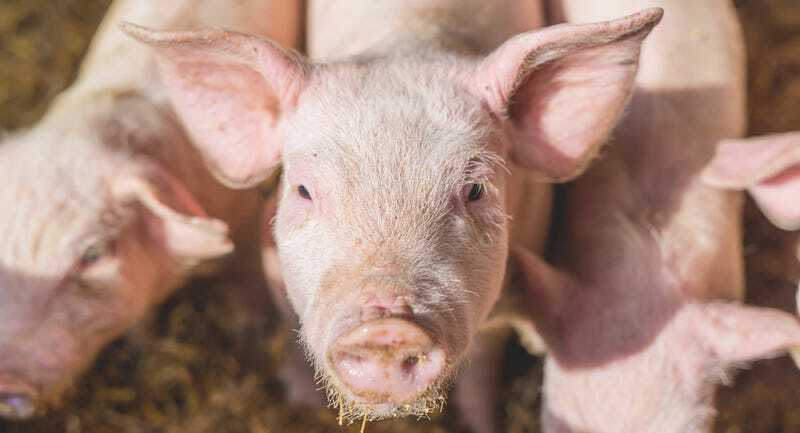 Also this summer, transplant experts at the University of Pittsburg say they kept a baboon alive with a kidney swap from a pig from for over four months, setting a record for longest “life sustaining” xenotransplant between a pig and a primate. This may sound like mad science at its maddest, and it certainly raises a host of ethical questions. But Martine Rothblatt, noted futurist and founder of the biotech company United Therapeutics, which backed the recent xenotransplantation efforts, believes this work will eventually lead to an “unlimited supply of transplantable organs.” And there is some precedent to go off. After all, pig heart valves have been used in human heart surgeries for years. In a famous 1984 case, a California newborn known as “Baby Fae” received a baboon heart. But it lasted only three weeks before failing. The human body reacts even more strongly to pig tissue, since pigs are genetically more distant. All human tests of pig organs have ended quickly, and badly. A Los Angeles woman who got a pig liver in 1992 died within 34 hours. The last time a doctor transplanted a pig heart into a person, in India in 1996, he was arrested for murder. The recent pig-baboon transplants made use of “humanized” pig organs that contain up to five primate genes. Sprinkling a little primate DNA in there does seem to be helping, but it hasn’t 100% eliminated immune rejection. The pig-hearted baboon in question, for instance, still had to be fed a powerful drug every day to suppress its natural immune response. What’s more, milestone that it may be, the recent cardiac xenotransplant was not life sustaining. The pig heart was attached to the baboon’s circulatory system and allowed to beat, but the baboon heart remained in place to pump blood. It’ll probably be years before anyone dares to try this in humans. At which point, science may have spawned a host of new organ transplant options, including cryopreserved organs, 3D printed organs, and cyborg parts. You can’t say the future won’t be exciting.